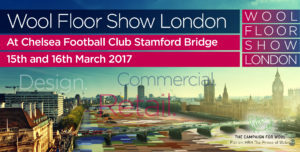 For the 2nd year running we will be exhibiting at the Wool Floor Show London which will take place on the 15th and 16th March 2017 at Chelsea Football Club Stamford Bridge. Here at Crucial Trading we have a great understanding and appreciation for the benefits of wool, with developing over 40 desirable ranges in a wide variety of colours. On display will be our full residential collection including two new ranges soon to launch, Wool Buttercup and Sisool Twine. Also available to view will be our recently launched Hospitality Collection. For more information about the show or to pre-register, visit www.woolfloorshow.co.uk.